The mob-mentality began last Saturday after President Trump said that the Democratic resistance to Supreme Court nominee Brett Kavanaugh was an attempt by an "angry mob" to hijack the proceedings "in their quest for power." 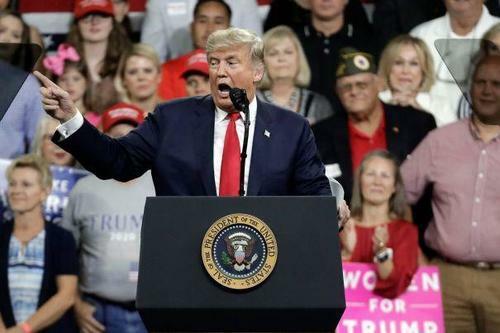 Trump then said "On November 6 you will have the chance to stop the radical Democrats — and that’s what they have become." To combat the phrase "mob" from being attached to leftists, the mainstream media has begun to push back against conservative guests who utter the word. This was immediately picked up on and turned into yet another viral video of reporters telling people not to say "mob" juxtaposed with more of the "unhinged left." During a Sunday campaign event in Georgia, former Obama Attorney General Eric Holder suggested violence against conservatives; telling the crowd "Michelle [Obama] always says ‘When they go low, we go high.’ No. No. When they go low, we kick them." Moments later Holder sought to clarify, saying "I don't mean we do anything inappropriate. We don't do anything illegal." Then in a Tuesday interview, Hillary Clinton rejected the idea that Democrats should be "civil" with Republicans in the age of Donald Trump. Perhaps the GOP messaging campaign is the only reason we didn't see the same highly organized protests after Kavanaugh's confirmation. Instead, the left seems to have completely forgotten about their latest hill to die on.